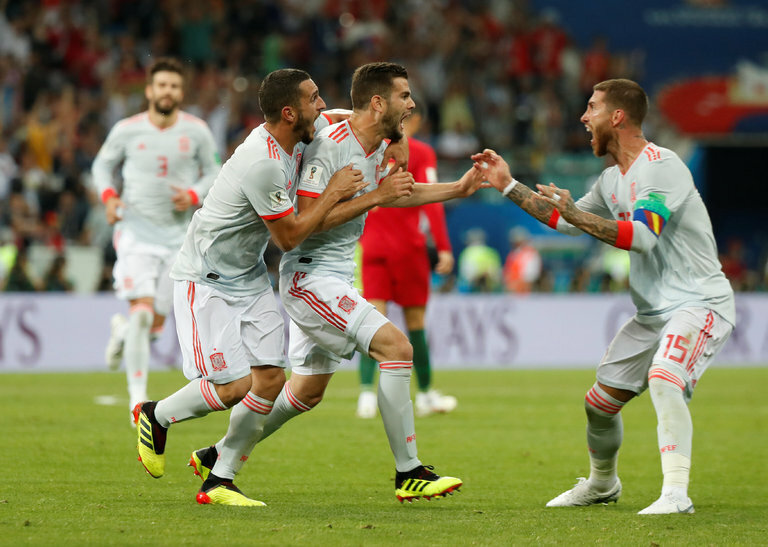 Cristiano Ronaldo scored a hat trick, Diego Costa countered with two goals, and the 2018 World Cup’s first full day got a welcome shot of energy as Portugal rallied on a late Ronaldo free kick to salvage a 3-3 tie with Spain. Ronaldo, who had scored on a penalty kick in the fourth minute and an error by Spain goalkeeper David De Gea in the 44th, saved the day for Portugal, the reigning European champion, with a stunning free kick in second-half injury time. Ronaldo had won the free kick himself and then, after composing himself, curled a picture-perfect shot around the edge of the Spanish wall and inside De Gea’s top right corner. Ronaldo’s celebration capped a thrilling back-and-forth game that had seen Portugal take a lead, give it up, grab it back, and then lose it once again on a goal by Costa and a rocketed shot by the Real Madrid defender Nacho. Costa’s first goal, a dancing effort in the penalty area in the 24th minute, had negated Ronaldo’s early penalty — awarded for what some thought was a soft foul against Nacho. Rory Smith: Ronaldo has produced one of the most remarkable individual performances you could possibly hope to see, and illuminated what will take some beating as the best game of the tournament. Portugal hasn’t been discussed much as a contender for the World Cup, despite being European champion. This may have been an oversight.